The video review will be published tomorrow. "Harry Potter and the Prisoner of Azkaban" marks a turning point in the series. Where previous games were published by Electronic Arts and developed by other studios, EA Games decided that, starting with "Azbakan", the rest of the series would be developed in-house by EA UK, later known as EA Bright Light. Between 2004 and the studio's untimely closure in 2011, EA Bright Light worked on twenty games, and six of them were "Harry Potter" titles. 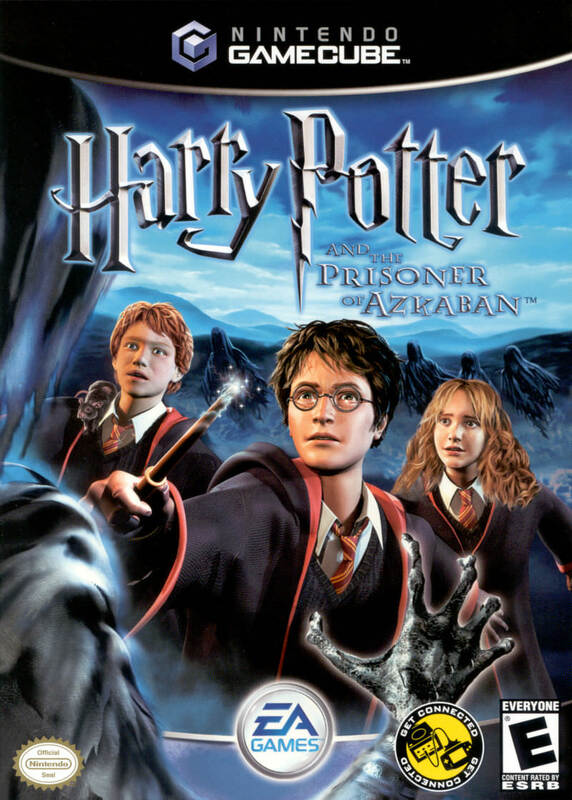 It's clear that EA UK wanted to make a killer first impression, and while it falters in places, "Prisoner of Azkaban"'s passion and love for the series are undeniably infectious. "Harry Potter and the Prisoner of Azkaban" is a brisk, satisfying take on the book that focuses primarily on Harry, Sirius Black, and Buckbeak. Every piece of information given to the player is the minimum needed to move the story along. The opening section with Aunt Marge and the Knight Bus is cut entirely, while the Marauder's Map is a gameplay mechanic instead of having a personal connection to Harry's father. Buckbeak replaces Harry's broomstick as the main flying mechanic, which makes this the first game in the series without a Quidditch match; Harry never loses his Nimbus 2000 since the player never has to fly it, and extra subplots are made up to keep Ron and Hermione occupied while Harry plays Quidditch off-screen. While the Sirius Black storyline is minimalist, the game isn't afraid of adding some interesting ideas of its own, such as a first-ever look at a Muggle Studies classroom with enchanted electronics, and a subplot with Draco Malfoy which even calls back to events from the second book. Unfortunately, the inevitability of The Deadline rears its ugly head towards the end of the game. The major reveals in the Shrieking Shack are covered in a scene that lasts just 25 seconds, most of the Time-Turner section is done through narrated cutscenes, and the few pieces of interactivity are brief and unsatisfying. Still, up until that point, "Prisoner of Azkaban" delivers what is required for a functioning story, even if it lacks the thematic resonance of the book or film. One area where "Harry Potter and the Prisoner of Azkaban" has unfortunately faltered is the graphics. The level of detail, especially when travelling around Hogwarts outdoors, has dropped dramatically, at least in the GameCube version. While dungeon design is more elaborate and certainly looks pretty in screenshots, this comes at the expense of the framerate, which is now locked at 30 frames per second and frequently dips well below that, to the point where it starts interfering with gameplay. Enemy animations are clumsier and glitch out at inopportune times, and the darker colour palette can have a negative effect on the level design as well. Thankfully, the individual character models are a big step up from the previous games; all the teachers are much closer to their film actors, and new areas have been added to Hogwarts to match the third movie, such as the pendulum in the Clock Tower, the wooden bridge, and the stone sundial on the grounds. Facial animation has improved across the board, and Hermione's long wavy hair actually looks halfway decent, something that's very hard to animate in 3D. Jeremy Soule once again knocks it out of the park with his soundtrack, and EA UK actually know how to mix his score properly. The structure and level design of "Azkaban" doubles down on the "Legend of Zelda" influences from previous games, with far more elaborate dungeons, combat arenas, and intricate puzzle design. This time around, the major gimmick is that instead of just one character, players can swap between Harry, Ron, and Hermione at any time. While all three have access to basic spells like Flipendo and Expelliarmus, each character has their own strengths. Harry can jump across gaps, call for Hedwig, use a new grappling-hook spell called Carpe Retractum, has access to the Marauders' Map, and can summon a Patronus; Ron has a bigger health bar, can blind enemies with Lumos, search bookcases for items, and is the best of the group at stealth; while Hermione is the slowest runner but has the most powerful spells, including Reparo and the freezing spell Glacius, is small enough to crawl into tight spaces, and, as in the books, only she and Harry can ride Buckbeak. The collectible wizard cards are also directly tied to one of the characters, and collecting all the cards in a specific set will increase one character's health bar. Sadly, while the foundation for the gameplay is quite solid, several issues prevent this game from being truly great. While spellcasting works decently, movement and platforming can be shaky thanks to an erratic framerate that sometimes causes control issues. Running around Hogwarts is still entertaining, though because Buckbeak replaces Harry's broomstick, players will be forced to run all the way from the main entrance over to Hagrid's hut if they want to explore the castle in detail. Additionally, Ron and Hermione are programmed to constantly nag Harry about where to go next, even if the player is perfectly on the right track and has never stopped for collectibles. Another issue is with combat, especially if the player is fighting enemies with special abilities, such as Redcaps (who have a long-range stun attack) or 3 on 3 fights with Malfoy, Crabbe and Goyle (who can Transfigure the player's head into a pumpkin). While battling one or two enemies is okay, the framerate will sink like a rock during these large confrontations. By far the most annoying problem, however, is with the dungeons themselves. For a game that encourages teamwork between Harry, Ron, and Hermione, the dungeons do everything in their power to separate the trio whenever possible. Maybe there's a gate which Harry and Ron have to hold open while Hermione crawls through and finds a way to unlock it from the other side; or perhaps Harry will jump a gap, and a cutscene shows the platform behind him crumbling to dust, forcing him to abandon his friends as he takes the long way around. In one infuriatingly blatant example, after Harry pushes a switch, a gate shuts behind him for no reason, forcing Ron and Hermione to take an arbitrary detour so they can rescue him. It's obvious that EA UK were trying their best, but perhaps they should have made shorter dungeons where every puzzle takes the abilities of every character into account instead of finding inane reasons to keep them separated. Even with the forced excuses to keep the trio away from each other, the dungeons are still genuinely fun. Puzzles are well thought-out, and during the few sections where the game allows more than one character in a room together, it feels very rewarding, especially during boss fights. Much like the film on which it's based, "Harry Potter and the Prisoner of Azkaban" is very ambitious, deeply flawed, but all the more enjoyable in spite of it. It may not be the most polished entry of the series so far, but it is my favourite of the main movie-based Potter games. Interesting stuff! I love these thorough reviews, even though I've been too busy lately to show it. Is this going to be the best of the movie tie-ins, or does this main series end up peaking with a game that manages to get its act together completely? Either way, I'm not holding my breath for anything to surpass Quidditch World Cup. Stalvern wrote: Is this going to be the best of the movie tie-ins, or does this main series end up peaking with a game that manages to get its act together completely? Not sure. I've heard some interesting things about Goblet of Fire and Order of the Phoenix. I think the most interesting thing from here on out is that the rest of the series is made by the same developer, so we'll be able to see their thumbprint despite the massive changes in genre.